Falcon will focus on the latest launches in its innovative F900 Series at GulfHost 2018. Falcon will be sharing a stand with Mono and Williams, demonstrating how the three company’s products work together to form a complete kitchen solution, and highlighting the latest developments and improvements to their range. 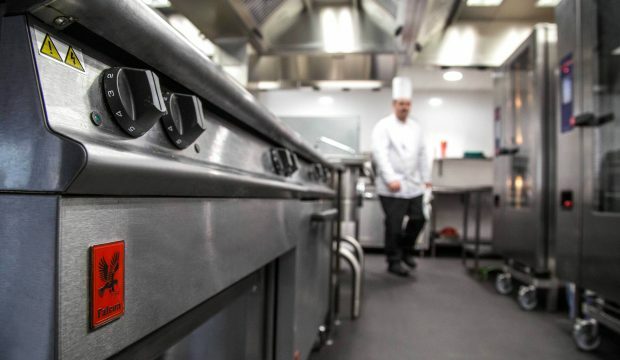 On stand, the appliances will be suited together in a single cookline to show off Falcon’s patented Dynamic Link System (DLS), which seamlessly links different F900 appliances together, giving the smart look of a single top, without the associated high price. The combination of the appliances’ attractive designs and the DLS make the F900 Series equality suited to kitchen or front of house cooking. “We’re looking forward to meeting with clients old and new, getting to know their businesses and their requirements, and demonstrating how our products will be able to help benefit them,” says Robert. One of the new products on display, the E9342 twin pan fryer is typical of the F900’s key selling points. It combines the high performance caterers expect from Falcon with an eye-catching, attractive design. It’s an ideal finishing fryer – rapid heat up and recovery times and with the option of individual filtration for each pan.